By Aaron Sharockman, Miriam Valverde on Tuesday, August 22nd, 2017 at 10:50 p.m.
President Donald Trump defended his response to the violence in Charlottesville, Va., during a campaign rally in Phoenix, on Aug. 22, blaming the media for distorting or omitting his full comments. "The media can attack me, but where I draw the line is when they attack you," Trump said. "It’s time to challenge the media for their role in fomenting divisions. And yes by the way they are trying to take away our history and our heritage, you see that?" We fact-checked several of Trump’s claims. Trump reads his first statement on Charlottesville, leaves out "many sides" comment. Trump blamed the media for not properly covering his initial statement on the violence in Charlottesville, Va., on Aug. 12, and proceeded to read portions of his initial remarks. "This is my exact words. ‘I love all the people of our country’ …. They (the media say), ‘Is he a racist?’ " Trump said. But Trump did not read the portion of his comments that were criticized by Republicans and Democrats for not explicitly condemning the racist, anti-Semitic protesters. "We're closely following the terrible events unfolding in Charlottesville, Va.. We condemn in the strongest possible terms this egregious display of hatred, bigotry and violence on many sides, on many sides. It's been going on for a long time in our country. Not Donald Trump, not Barack Obama. This has been going on for a long, long time. It has no place in America. What is vital now is a swift restoration of law and order and the protection of innocent lives. No citizen should ever fear for their safety and security in our society. And no child should ever be afraid to go outside and play or be with their parents and have a good time." "This is my exact words. ‘I love all the people of our country’ …. They (the media say), ‘Is he a racist?’ "
"CNN, their ratings are going down." CNN is at a five-year high in several key categories, according to data provided by the Nielsen Company. "Wages haven’t gone up in a long time." Trump repeated a line from his Aug. 15 press conference with reporters at Trump Tower. It’s False. His point is significantly out of date. Wages have been increasing for the past three to five years, depending on the measurement you use. "Economic growth has surged to 2.6 percent … Remember I said we’re going to try and hit 3 percent, we’re already at 2.6 percent, maybe I’ll have to increase my offer." 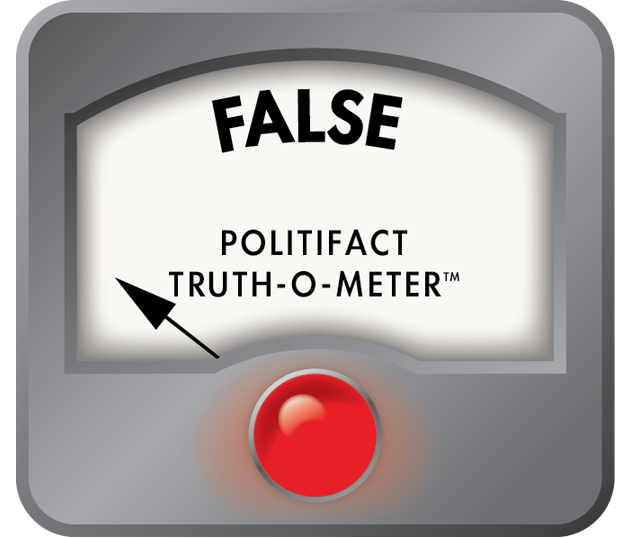 Trump actually promised 4 percent GDP growth during the campaign. At the presidential debate in Las Vegas, he said: "And I actually think we can go higher than 4 percent. I think you can go to 5 percent or 6 percent." The GDP indeed grew at an annual rate of 2.6 percent between April and June, according to the Bureau of Economic Analysis, more than double the rate at which it grew in the first quarter (1.2 percent). "This was the scene of my first rally speech. Right? The crowds were so big, almost as big as tonight." Trump is known to exaggerate his crowds, and he exaggerated the size of that crowd that first came to see him back in July 2015 at the Phoenix Convention Center. Then-candidate Trump described an audience of 10,000 to 15,000 to 20,000 people coming to see him for his July 11, 2015, speech. But the city fire department said capacity for the ballroom where Trump spoke in 2015 was 4,200 people. The doors were closed at 4,169 attendees, said Phoenix Fire Department spokeswoman Shelly Jamison. For the record, the 2015 Phoenix rally was his second campaign event. Trump held a campaign rally June 17, 2015, in New Hampshire. "The only times they show the crowds is when there is a disrupter." As Trump spoke Tuesday, we watched as CNN showed the crowd at the Phoenix Convention Center. "Arizona is a disaster in terms of the price increase in terms of insurance. 116 percent increase." The basic numbers are easy to confirm: Those increases are indeed accurate for 2017 compared to 2016 within the Obamacare marketplace. Arizona has by far the largest increase in the nation. The caveat is that for many people on the health care exchanges, federal subsidies are offsetting those premium increases. "We’ve also obtained (a) historic increase in defense spending." That’s False. The defense spending increase Trump laid out in his 2018 budget is not an unprecedented change, regardless of whether it includes war-related spending. Trump’s proposed base spending cap for 2017-18 defense spending is $603 billion, a 9.4 percent increase. There have been 10 years since 1977 when the base level has gone up by more than that, and in some years, the increase more than doubled Trump’s. In 1981, President Ronald Reagan hiked the spending cap by 24.9 percent and by 20.4 percent the following year. More recently, President George W. Bush bumped spending by 10 percent in 2009. It’s also not the done deal Trump described. In order to actually increase defense spending, Congress will have to appropriate the funding and raise the budget cap. Border "down 78 and almost 80 percent"
The New York Times, "they practically apologized." It’s False that the New York Times apologized to Trump. A Nov. 13 letter to readers from the New York Times’ publisher and executive editor mainly thanks readers for their loyalty and says that the publication will "rededicate" itself to the high journalistic standards it has employed thus far. Nowhere in the letter did the authors write anything like an apology. Nor did they say that the organization’s overall coverage of Trump was "bad." Says CNN "fired Jeffrey Lord, poor Jeffrey. Jeffrey Lord. I guess he was getting a little bit fed-up and he was probably fighting back a little too hard." Trump’s claim ignores the reason behind the dismissal of Lord, a regular pundit who defended Trump. Lord tweeted the words "Sieg Heil!" to Angelo Carusone, the president of liberal watchdog group Media Matters. "Nazi salutes are indefensible. Jeffrey Lord is no longer with the network," CNN said in a statement. "There aren't too many people outside protesting." That’s False. For hours leading up to the rally, the coverage on national networks showed sizeable crowds out on the streets carrying signs criticizing the president and his response to the Charlottesville, Va., riots ignited by supporters of white supremacist and anti-Semitic groups. Local media also reported on thousands of anti-Trump protesters out on the streets, some photos show protesters held back by barricades outside the convention center where Trump was speaking. After the rally, the Phoenix police chief said the city’s downtown had "tens of thousands" of people exercising their First Amendment rights.